Boy do I wish I had a picture of this dish. This dish all started when my sister Terri and I found a package of Squid Ink Pasta. Now I don't remember where we bought it - but I do remember thinking it would make a great Halloween Dish - just with red sauce. Terri thought it looked kind of like Medusa's snake hair. She made some bread dough. Then she inverted a pyrex mixing bowl onto a baking sheet. 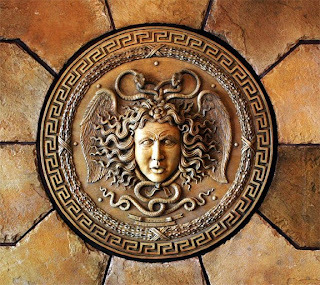 She covered the bowl with foil (and I think sprayed it with cooking spray), and then proceeded to mold a bread bowl of Medusa's face and a few snakes out of bread. The whole thing went into the oven to bake. After it was baked, she flipped it over, cooked the pasta, tossed it with red sauce and filled the "head" with the black pasta. They are actually better if people are blindfplded, but otherwise they are yummy. These ghoulish dishes dound delish!